﻿Healthcare in this country continues to focus on symptom suppression and is slow to adapt Wellness and Prevention as its Dharma. We at MDi believe that Lifestyle Modification centered on Wellness and Health Enhancement is the key to overcoming the many maladies that afflict mankind. To make our Wellness Programs easily accessible to a larger audience, we now offer our WOW (World of Wellness) VIP Membership program. Access to ten (10) Wellness & Health Enhancement Classes per month! Up to 50% discount on selected health services at MDi! 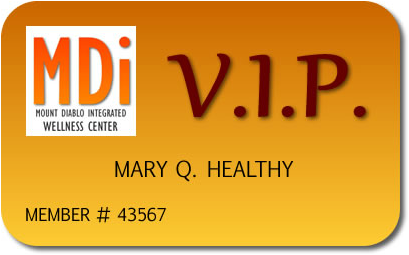 VIP Email Access to MDi Providers for general health questions! Classes include Yoga, Chi Gung Energy Movement Exercises, Tai Chi, Dance Therapy, Sound Healing, Meditation, Ayurveda, Healthy Cooking, Fitness, Personal Transformation, Energy Healing and Satsangha Health Support Group discussions. New classes are added each month. Currently we have twenty (20) classes offered Mondays through Fridays from 12-1 PM. Regular drop-in price is $20 per class; WOW VIP members can attend up to ten (10) classes per month with their membership. Class types and times may change month to month. For a current listing of upcoming classes, visit our calendar.